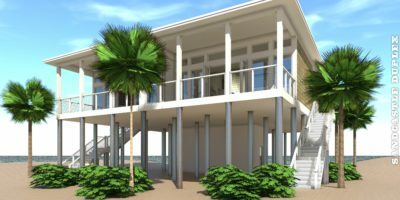 The Sea Oats House Plan. Two beautiful suites flank the entry foyer and hallway. Beyond, the home opens to an ornate stairway, family, dining and kitchen. The dining and family rooms open to the verandah through a large set of sliding doors. Upstairs the office and third suite have spectacular views. Landlubber Garage is designed to compliment this house. Parking below the house, or purchase the Landlubber Garage. In 2014, this plan was featured in Luxury Home Design Magazine, Winter Edition. In 2008, this plan was the featured as exclusive content on the Coastal Home Plans website. The SeaOats plan, built on an island off the coast of Newfoundland, Canada. The customer modified the plan to enclose the ground level for extra storage. View more about the Sea Oats House Plans or view all photo albums. Construction of the SeaOats plan in Louisiana was featured in Bayou Life.